Titration is used to find out precisely how much acid neutralises a certain volume of alkali (or vice versa). 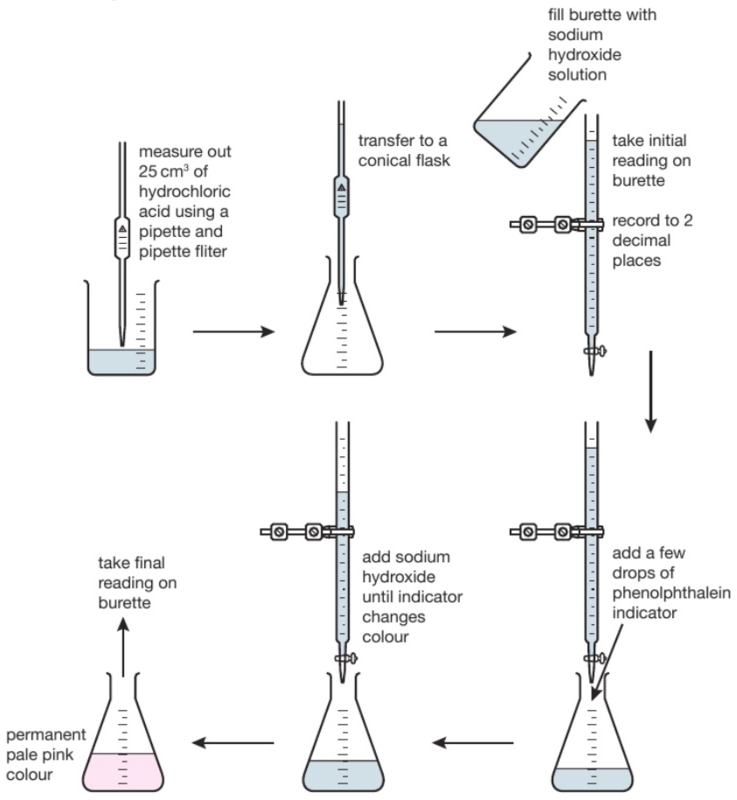 The diagram shows the titration method for a neutralisation reaction between hydrochloric acid and sodium hydroxide, using phenolphthalein as an indicator. The indicator changes colour when neutralisation occurs. The conical flask is swirled to mix the solutions each time alkali is added. When reading the burette it is important to be aware that the numbers on the scale increase from top to bottom. Readings are usually recorded to the nearest 0.05cm³ so all readings should be written down with 2 decimal places. The second decimal place is given as a ‘0’ if the level of the solution is on a line, or ‘5’ if it is between the lines. The volume of alkali added is calculated by subtracting the final reading from the initial reading. Various indicators can be used such as phenolphthalein or methyl orange. However universal indicator should not be used since it has a wide range of colours rather than one specific colour change so it would be unclear when the precise endpoint of titration was achieved. This process is repeated a number of times. The first time it is done roughly to get a good approximation of how much alkali needs to be added. On subsequent attempts, the alkali is added very slowly when approaching the correct volume.